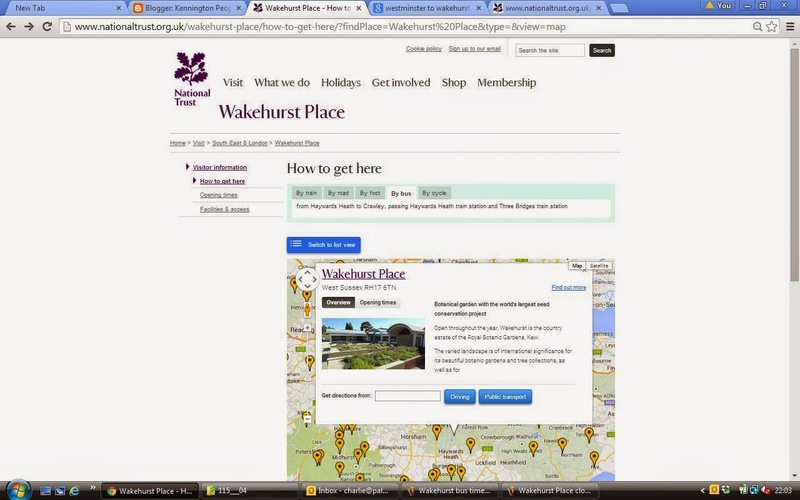 How can Wakehurst Place increase admission-paying visitors? How could better promotion of public transport and active travel help turn around the declining number of visitors to Wakehurst Place in West Sussex? Owned by the National Trust, Wakehurst Place is a country estate that is let to the Royal Botanic Gardens, Kew and houses the Millennium Seed Bank. Visitor numbers reached 315,000 in 2013-14 but fell to 164,000 in 2014-15, after the charges were brought in. The parking charges were brought in as measures to tackle a £1.4m deficit. National Trust members have free entry to the gardens, but have had to pay for parking since last year. Parking costs £10 a day to those entering Wakehurst Place free using their National Trust membership, which costs £60 for annual adult membership. Parking is included free for the day for non-National Trust members within their admission ticket (£12.50 per adult), and for Wakehurst Season Ticket holders (£25 for unlimited visits per annum, including a bonus free £15 ticket to Kew Gardens) and for Friends of Kew (£72 per annum, gives unlimited free admission for you and a person from your family to both Kew and Wakehurst). The Royal Botanic Gardens are clearly trying to get some more income from free-entry National Trust members many of whom, it would appear, are instead choosing a location with free parking. Frequent visitors may decide to buy a Wakehurst Season Ticket, but one-off visitors are going elsewhere. While the lower attendance won't lower ticket income, it will dent cafe and gift shop takings. Of course, if there is a non National Trust member in the car, they'll have to pay £12.50 admission which gets the day's free car parking. The challenge for Wakehurst Place, just 35 miles from central London, is to increase the number of paying visitors. Given that Inner London has a population of 3.2m but 58% of households here don't have a car (2011 census), can Londoners who don't own cars and aren't National Trust members be tempted? 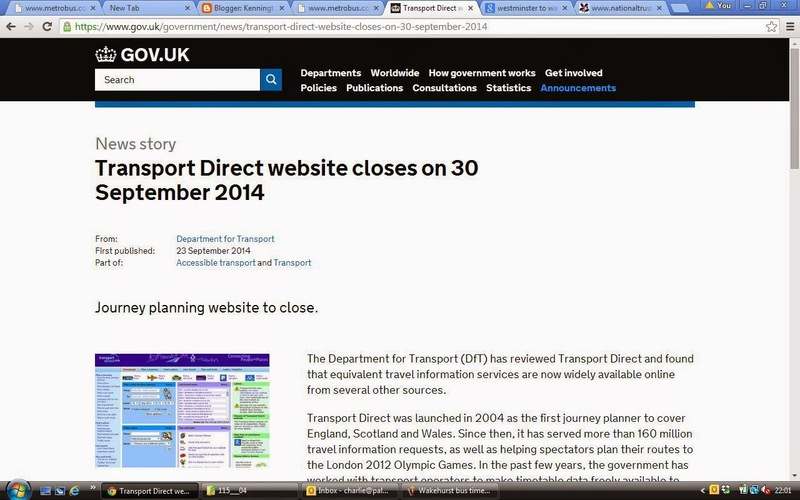 How is public transport promoted currently? 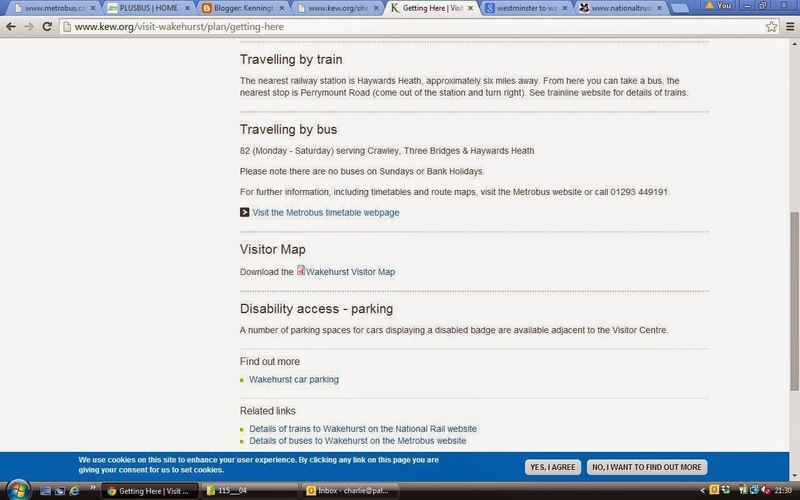 On the Royal Botanic Gardens Website no information is immediately visible but if you scroll down the 'Getting Here' page you see that there is a train station six miles away with no bus service on Sundays or Bank Holidays. No suggested travel times, indicative price information, local cycle hire, taxi service or walking information is given. 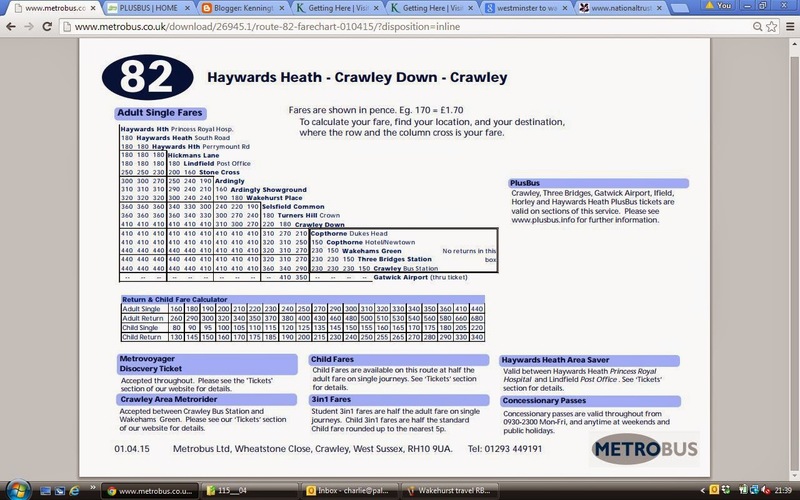 I'll decide not to travel on Sunday or a Bank Holiday, but on a Saturday instead, and start checking bus information using their link. I'm taken to the Metrobus home page and have to refer back to the Royal Botanic Gardens website to check the bus number and insert that, then open a timetable PDF, to discover that I can take a bus in the morning only at 9.42 or 11,42, returning at 14.42, 16.04 or 18.07. How hard would it be for the Royal Botanic Gardens to put the few bus times, the prices, matching rail times and journey duration from London and indicative prices on their website? Or to include the fact that there's a station just four miles away, on a direct line from London Victoria, that has a footpath to Wakehurst Place if you're coming on a Sunday or Bank Holiday? And that's almost as far as I go without being paid a consultancy fee to show the Royal Botanic Gardens or National Trust how to do this kind of thing properly - happy to oblige: tweet me @kenningtonpob. Finally, as far as I can tell, neither the Kew website or the National Trust one offers a discount to Wakehurst Place if you come by more planet friendly public transport (except of course that you can park your non-existent car for free). "Hello - I just wanted to say a massive thank you for everything you're doing for cycling in Lambeth at the moment - it's amazing. I have recently bought my bike through Try Before You Bike, which was SUCH an amazing scheme and pushed me to do something I'd thought about but would probably not have got round to due to lack of confidence about what to buy/equipment needed etc. I then had a session with Cycle Confident to help me with a route on my way into work which really changed my attitude to cycling and made me feel far surer about myself on the road. Then we've recently got bike hangars in nearby roads which meant I could get my bike and the kids' out of the hallway, eradicating a source of tension between me and my husband! And THEN cycling home from work the other day, I saw Dr Bike and got my (slightly dodgy) brakes adjusted and seat raised - all for FREE! AND cycling into work a day or two ago, there was a police stand who ID'd my bike and registered it and advised me about cycing with lorries. I am in rhapsodies about all you're doing; it really is fantastic, thank you. Much appreciated. Keep it up and thanks again!" If you want to find out what infrastructure changes are being made / planned in Lambeth please attend Lambeth Cyclists meetings on Tuesday 21 April and 19 May when representatives from Lambeth will update us and invite comments.